Welcome back!! Now for the actual pattern to make this adorable hot pad design. This design was originally created with regular yarn. However, after making one with tarn and testing them both, the tarn hot pad held up to the heat much better. As I shared in Part 1, the beauty of this design is you can go to a size based on your 'pan' needs. Blocks 1, 2, 3 and 4 measure 6 1/2" by 8 1/2"
Blocks 1, 2, 3, 4 and 5 measure 8 1/2" by 9 1/2"
All 6 blocks measure 11 3/4ths by 9 1/2"
Most of the pop tab hot pads I make are up to blocks 4 and 5. However, I needed a 9x13 hot pad, so I decided to go 6 blocks which was perfect. Making it with 6 blocks let me use 3 colors twice. Tarn - small amounts but enough to make each block composed of 5 rows (3 single crochet and 2 double crochet rows). You'll need 1 color for each block as well as a divider color. Attaching pop tabs is always done with wrong side facing you. So double crochet row will always be made on right side. Pop tabs are always worked with bottom hole on right. This makes layering easier as 2nd pop tab will always be placed behind the 1st or previous pop tab. 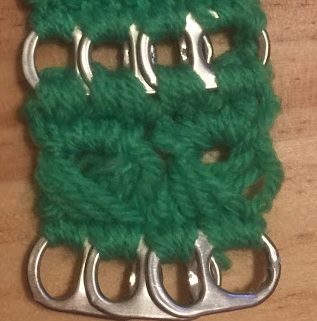 Row 1: With wrong side of pop tab facing you, and bottom of pop tab hole on the right -join 1st color with slip stitch and make 2 single crochet stitches. 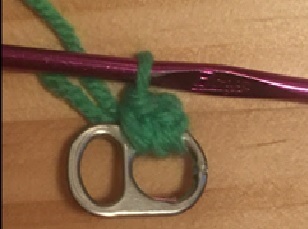 Add a 2nd pop tab as shown in the picture - left hole of 2nd pop tab goes behind 1st hole of previous pop tab, make 2 single crochet stitches through both pop tabs. Continue 2 more times for a total of 4 pop tabs. Row 2: Double crochet in each stitch across. (12 stitches) Chain 1 then turn. Row 3: With wrong side facing you, place right side of pop tab - bottom hole of pop on the right - make a single crochet stitch through first stitch and hole of pop tab - left pic is how you should be holding it now and right pic is back view. Crochet 2 single crochet stitches in next 2 stitches. 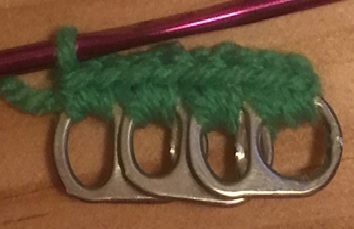 2nd pop tab layered on 1st will be stitches 4 and 5 from Row 2. Repeat across (middle pic). When done, turn work with right side facing you and open pop tabs (right pic). Chain 1 and turn. Row 4: 2 Double crochet stitches in each hole across. Row 5: Repeat Row 3 for layering pop tabs. When row is complete, turn work with right side facing you and open pop tabs. Fast off. Feel free to weave in your end now or crochet the end in behind a stitch. Either way works. Choose which side and with divider tarn - attach with slip stitch in pop tab hole. 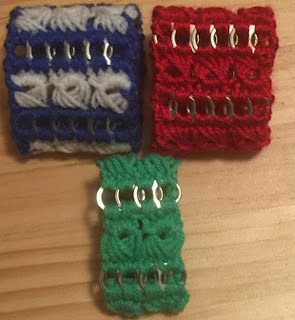 Make 2 single crochet stitches in each stitch made evenly across for a total of 12 stitches. Fasten off. For Block 2, repeat Rows 3, 4 and 5. For the border - there are 2 different ways of finishing the border: the Crochet way or Guilt Way. The Crochet Way making a single crochet in each stitch around. 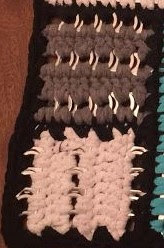 The Quilt Way is making a single crochet in each stitch across along 2 parallel sides (see below pic), then finish off by making single crochet stitches on the opposite 2 sides. Fasten off, weave in ends and you're done!! In case you're wondering - I mentioned the 'Quilt Way' because I make memory quilts. The memory quilts are made out of the dearly departed clothes. Thank you again for your visit and I look forward to seeing you with my next crochet pattern. I really didn't want to call this a 'puppy potty pad because it was made for 2 rebellious cats. I call them rebellious because when they went from being outdoor/indoor cats to indoor only cats, they started to do bad acts. To be closer to my grandchild (and soon to be grandchildren - grandson expected at the end of this month), we moved into a house with a large pond in the back yard. And this pond comes with duck families and beautiful birds. This pattern may not be sold, published, reproduced-mechanically or electronically, or by any other means, including photocopying from any website(s) or electronic mailing lists, etc.. Please do not offer, sell or distribute this pattern in any way to anyone else. I have recently fallen in love with the Broomstick Lace crochet stitch. I wondered how it would look made with pop tabs. In less than a half hour, I had a beautiful pop tab bracelet. The only 2 stitches you need to know are slip stitch and single crochet. The bracelet/cuff is made for slide on/off. Whether you are using plarn, tarn or regular yarn, there is stretch which makes the slide on/off comfortable. 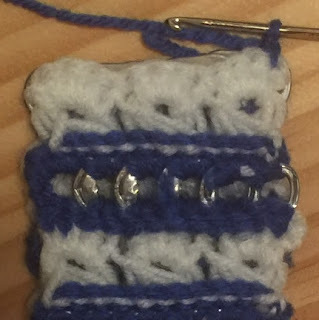 Pattern note - As you can see in the pic below, removing the clipped piece from the inside of the pop tab gives a cleaner appearance to the exposed edge of bracelet. Join with a slip stitch in first hole, make 2 single crochet stitches in same hole. 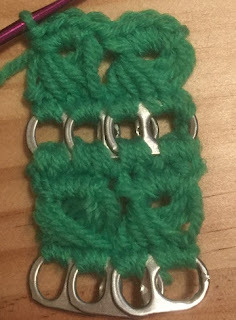 For 1 Broomstick Lace stitch, make 2 single crochet stitches in next hole. Jump down to Row 2 instructions. For wider bracelet - continue to Step 2. 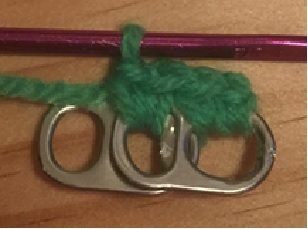 Lay 2nd pop tab behind 1st pop tab as shown in pic below and 2 single crochet stitches into hole through both layers. 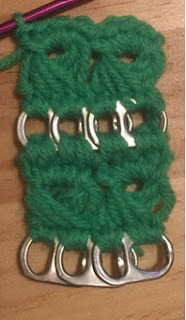 Continue layering 2 pop tabs for each Broomstick Lace for a wider bracelet/cuff. Pull up a loop from each single crochet stitch made from the previous row by inserting hook into the single crochet stitch, yarn over and pull up a loop sliding it onto stitch holder. 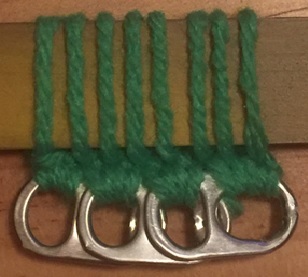 In picture below, a standard ruler was used as the stitch holder. Most instructions suggest a large knitting needle. It's really the designer's choice. Continue pulling up loops across to the last single crochet stitch. When end of row is reached, turn. Step 5: Starting next pattern set - with wrong side facing you, place the right side of pop tab to right side of piece, pull a loop through first single crochet stitch and first hole of pop tab, chain 1. Make a single crochet stitch in same stitch and in each stitch across. When finished, straighten up pop tabs. Below pic shows back view. 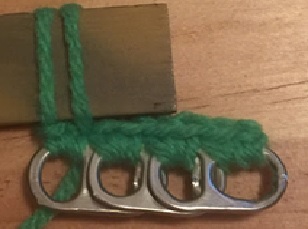 Chain 2, turn piece with right side facing you. 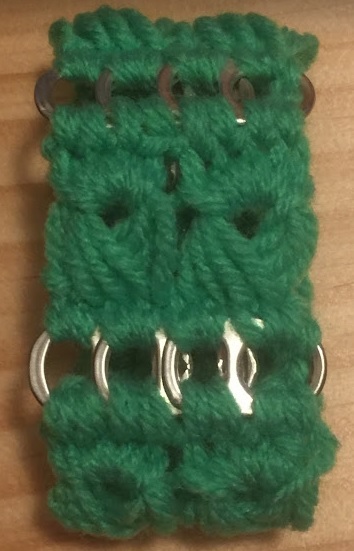 Make 2 single crochet stitches in each hole across. Repeat from Step 2 until desired fit. To finish the bracelet/cuff - with wrong side facing you, fold piece in half matching beginning pop tab row with last single crochet row made - repeat Step 5. As you can see, this design is very versatile. I look forward to seeing your finished designs. Let me know if you have any questions. This bag measures 10" wide and 8" in height. I created this bag and several more since to keep smaller veggies/fruit safe while I do my grocery shopping. The pattern can easily be modified to the width and height of your choice. The width of bag is the width of the ziplock bag. Cut about 1" off bottom and slit up the sides all the way to solid color strip. Lay bag on flat surface and fold over top layer. This is to keep the layers separate while taping. Working on the inside, fold bottom of bag up to solid color strip and tape across placing tape just below solid color strip. Tape around a couple of times. To avoid the ziplock closure from protruding through the sides of bag, measure approximately 1" from the bottom and with your scissors make an inward diagonal cut on both sides. Hole punching method - 2 holes are made for each stitch. Starting at the edge, punch 2 holes side by side about 1/4" apart, measure about an inch and make another set of holes. Repeat to end. Do the same for other side. Row 1: Chain 32, single crochet in second chain from hook and in each stitch across, chain 1 turn. 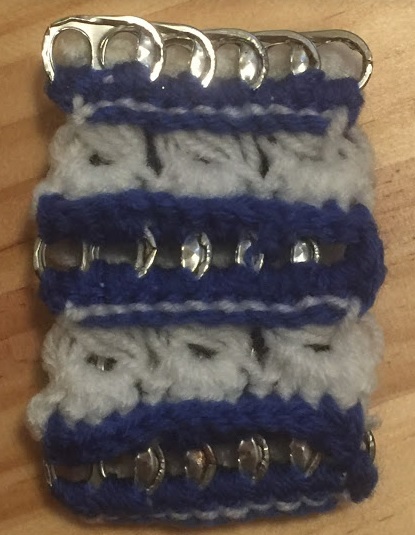 Row 3: The pattern for each row is double crochet stitch, * chain 1, skip 1 stitch, double crochet. Repeat * 6 times. Double crochet in next 3 stitches, repeat *pattern. Row 4: Repeat Row 3 thru 20 or desired height of bag. To determine desired height, fold bag in half matching top and bottom edges. At end of last row made, chain 1, single crochet in each end stitch. Fasten off, leaving enough tail for whip stitching sides together. 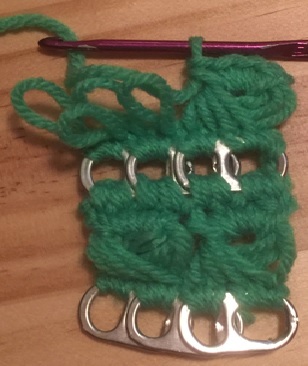 Repeat on other side - count the number of single crochet stitches to ensure both sides are even. Before stitching sides together, I have always found it to be so much easier to attach the ziplock closure first. Designer's preference really. After you make a few of these, try it both ways and then determine what's easiest for you. Cut approximately an 8" piece of yarn. Open ziplock bag - place it on wrong side at edge of bag with ziplock even with top edge. Enter needle from wrong side around a stitch on right side coming back out to wrong side in 2nd hole then make a knot with other end of tail. Go to next set of holes entering from wrong side around stitch on right side and back out through 2nd hole. Repeat to opposite end. Repeat stitching in opposite direction going back to starting point. Fasten off, weave in remaining tail. Using same stitch method, attach ziplock bag to opposite edge of piece. Weave in remaining tail. Stitching sides: Stitch method to use is really the choice of each designer. The method used here and with the majority of my designs is stitching through the back loops of each side. It gives an attractive appearance on the right side. Pull the bag through the ziplock opening so wrong side is out. Using tail, whip stitch each side together. First determine placement of straps. Join with a slip stitch 2 stitches to the right where one strap will be. Round 1: Single crochet in each stitch around. Join with a slip stitch to complete round. Row 1: Single crochet in next 3 stitches, chain 30 or desired length of strap, single crochet on bag and in next 2 stitches. Chain 1 and turn. Row 2: Single crochet in same stitch and in each stitch across. Fasten off, weave in ends. Repeat on opposite side for 2nd strap.